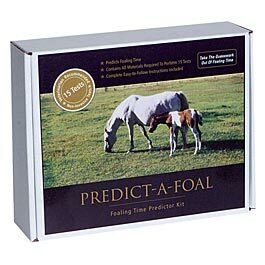 The Predict-A-Foal™ Kit An easy-to-use test kit for predicting the possibility of foaling within 12 hours with up to 95% accuracy. The test kit is designed to test for levels of cations in the colostrum. The Predict-A-Foal™ kit includes supplies for 15 test and additional test strips can be purchased separately. Use a sample (1 tsp) of milk from the mare, add to solution, mix & use test strip. Compare test strip to chart & read results. It is that easy! Instruction booklet included. Breeder's Choices own experts have use this kit and give it a thumbs up for accuracy.